This Esl reduces enemy npc ranged accuracy to about 75% of vanilla Fallout 4. This Esp reduces enemy npc ranged accuracy to about 75% of vanilla Fallout 4. This Esl reduces enemy npc ranged accuracy by about half for Fallout 4 base game only. Thanks to DaveBoss1 for converting the esp to esl. 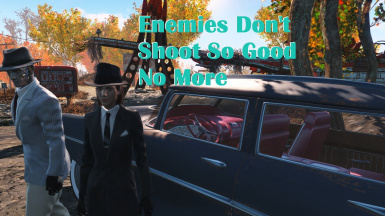 This Esp reduces enemy npc ranged accuracy by about half for Fallout 4 base game only.